The Congressional Budget Office released their latest massive 225-page 10 year economic outlook report today. 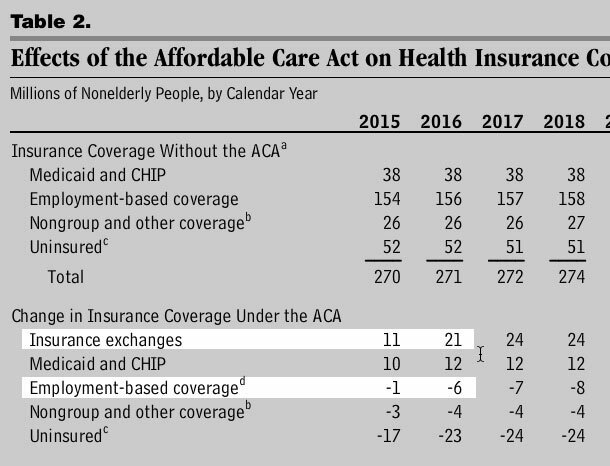 Obviously there's a ton of stuff there, but the part of most interest to me is, of course, their revised projections for ACA-related matters, both in terms of people and dollars. In the March 2015 baseline, CBO and the staff of the Joint Committee on Taxation (JCT) projected that an average of about 8 million people per month would receive exchange subsidies in 2015. Additionally, the agencies projected that about 3 million people would not be eligible for subsidies but would purchase coverage through an exchange, for a total of 11 million people enrolled in coverage through exchanges in any given month, on average. CBO and JCT now estimate that about 9.5 million people enrolled in coverage purchased through the exchanges, on average, during 2015 and that 8 million of those enrollees received subsidies. OK, so what about 2016? Major Health Care Programs. Outlays for the federal government’s major health care programs will increase by $104 billion (or 11.1 percent) this year, CBO estimates. That amount overstates underlying growth in the major health care programs, however, because it reflects a $24 billion shift in the timing of certain Medicare payments from 2017 into 2016. After adjusting for those payments, CBO anticipates that spending for the major health care programs will rise by $80 billion (or 8.6 percent) in 2016, compared with $105 billion (or 12.6 percent) last year. Medicaid spending is expected to increase by $31 billion (or 8.8 percent) in 2016; the projected rate of growth in outlays is a little over half the average rate of growth recorded over the two previous years, primarily because the optional expansion of coverage authorized by the ACA will have been in place for two years and the rapid growth in enrollment that occurred during the initial stage of the expansion will have begun to moderate. CBO projects that under current law, total enrollment in the program will increase by about 2 percent in 2016, about a third of the rate of increase in 2015. Similarly, subsidies that help people who meet income and other eligibility criteria to purchase health insurance through exchanges and to meet their cost-sharing requirements, along with related spending, are expected to increase by $18 billion in 2016, reaching a total of $56 billion. The higher spending reflects an anticipated increase in the number of people expected to receive subsidies for coverage purchased through exchanges. CBO and the staff of the Joint Committee on Taxation (JCT) estimate that about 11 million people will receive exchange subsidies, on average, during calendar year 2016, compared with an average of 8 million in 2015. Additionally, the agencies project that about 2 million other people will purchase coverage through an exchange but will not be eligible for subsidies—for a total of 13 million people, on average, enrolled in policies purchased through exchanges. OK, so 13 million people on average per month, of whom around 11 million (85%) are expected to qualify for APTC subsidies. How does this compare with my own estimates? 2014: CBO projected 7 million, then 6 million. Actual monthly average exchange enrollment was around 5.5 million out of 8.0 million QHPs selected during Open Enrollment, only a 69% ratio. The main reason for this is that, as noted above, a good 40% of 2014 enrollees didn't start coverage until April or May. 2015: CBO projected 13 million, then 11 million. Actual monthly average ended up being 9.5 million out of 11.7 million QHPs selected. With most of the tech issues resolved and the shorter open enrollment period, about 80% of enrollees had their policies kick in starting in January, with the rest starting in February or March. 2016: CBO now projecting 13 million. The HHS Dept. originally projected a total of around 12.6 million QHPs selected, while I projected around 14.7 million. I've since dropped my projection down to around 14.0 million even. Assuming the same 81% ratio as last year (the start/end dates are very close this year), that would be around 10.2 million on average using HHS's projection and 11.9 million using mine. The big unknown here at the front end is the purge factor. If the bulk of the unpaid/cancelled policies are already removed from the official QHP selection number before the end of open enrollment, that means a significantly lower attrition rate as a percentage of that number. What is interesting to me is that unlike several prior CBO budget projections, this one doesn't include the 10-year enrollment outlook table.